There are hundreds of classic blocks out there that have been around for more than a century. Sometimes, you just want something a little more surprising. So we can take those tried and true blocks and alter them to make something new. It is called a disappearing block. You take a symmetrical block, cut it into equal fourths, or ninths, or just strips, and turn them around. The results will surprise and delight you. Pam did this very thing with her quilt. These are pinwheel blocks that were cut into three equal strips and then the sides are flipped upside down. Quite a change don’t you think? 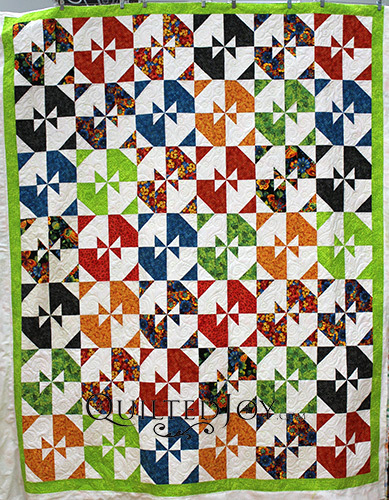 This is Pam’s Disappearing Pinwheel quilt. Pam was able to find some really beautiful prints to use in this quilt. All the colors are bright and deep. I especially like the black background with the butterflies and flowers. Pairing them with the white brought some brightness so the disappearing pinwheel is not too dark. And then she framed it with that lovely bright green border. I had the opportunity to quilt this disappearing pinwheel quilt for Pam. She picked a ribbon-like curling design. It has a really lovely swirl and curl going on. Some of the curls cross over themselves causing a ribbon like effect. It is very curvy and adds a lot of movement for a top with so many straight lines. Pam and I decided to be bold with the thread color. I used a green 40 weight thread from Glide called Turf that matched her lime green border. It really pops in the white fabric, but disappears in the colorful prints. It adds one more playful element to a really fun quilt! Curling ribbons is such an elegant and romantic quilting design. I quilted Pam’s quilt with my Intelliquilter, but I love free hand quilting curls and swirls. You can make them big like in Pam’s quilt for an all over design. You can shrink them down to create a sashing design, like in this tutorial video. Or you can make them small and dense for a background filler, like in this tutorial video. I love quilting them! It’s such a meditative design, it’s like yoga for quilters! Next time you go to make a top and don’t know what you want to do, try a disappearing pinwheel or some other disappearing block. Take a classic or basic block, cut it up, and rearrange it to make a real show stopper.